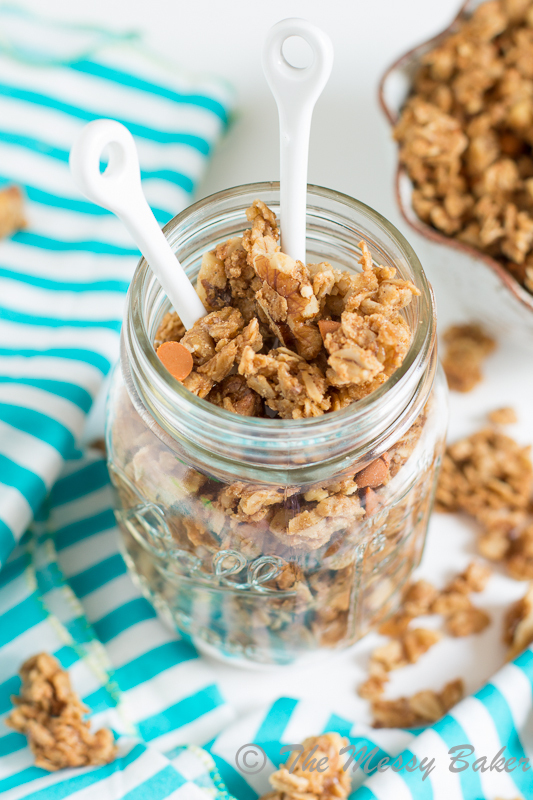 Cookie Butter Cinnamon Chip Granola is a sinfully sweet and utterly addictive treat. Loaded with pecans, warm cinnamon notes, and rich cookie butter, this treat is sure to please. I am the snack master. As in, I can totally take down an entire bag of chips, sleeve of cookies, pan of brownies, king size candy bar, or carton of ice cream in one sitting. My sweet tooth is fierce and, quite frankly, out of control. I crave things like donuts, chocolate, ice cream, and the list goes on. Oh, and one bite is never enough. In the blink of an eye, I can devour an entire lot of just about anything you set in front of me. A disease? I’d like to think so, but, the fact is, it has nothing to do with some rare, potato chip binge eating disease. The truth: I possess no willpower, absolutely none! It just doesn’t exist. I think, “Well, I’ll just have a smidgen.” Next thing I know… Gone! Who am I kidding, I’m a machine when it comes to food consumption. I really should enter a formal food eating challenge. Heck, I’d probably take the gold. My medal will read National Food Hoover. Eh, we all have our strengths, I guess. One time, just for laughs and giggles, I consumed 10 tacos in a matter of minutes and a tray of stuffed jalapenos. Help, I’m out of control! I know what you’re thinking, “Girl must me a biggin’.” By some miracle, I’m not. I’m 5’1″ and weigh a buck twenty. Am I in possesion of a muffin? You’re darn skippy, I am! Well, I’m not about to let my muffin take over and start calling the shots, so it’s time I start snackin’ the right way. 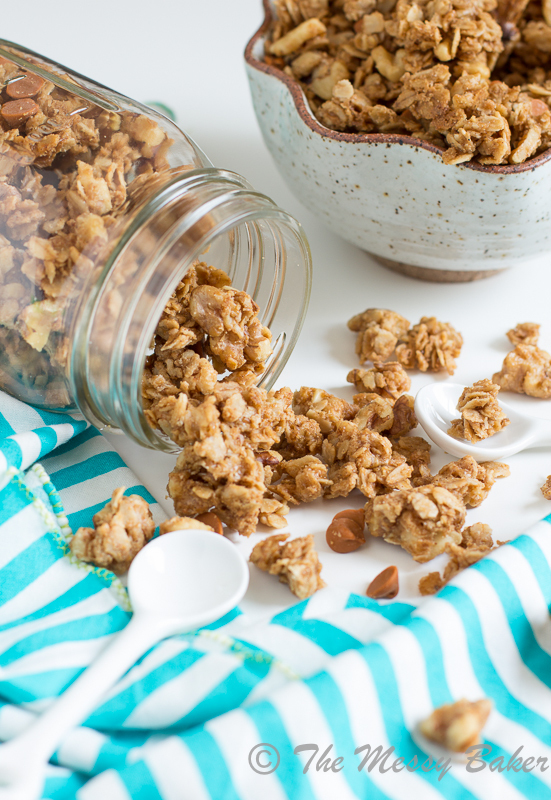 Granola is the perfect semi-healthy snack, and this cookie butter cinnamon chip granola is the bees knees of all granola recipes. Is it as healthy as, say, a carrot? Well, no. But is sure does beat an entire bag of North Carolina BBQ chips or an entire sleeve of thin mint cookies (those dang evil girl scouts). It’s all about a middle ground…and maybe some exercise. Yeah, I hauled myself out of my comfy chair to hit the pavement and the gym. Say good bye, muffin! Oats are a blank canvas just waiting to painted with vibrant flavors and various spices. You can pretty much add any of your favorite flavors to a bowl of oats and the end result will always be tasty. I happened to have a jar of cookie butter (a.k.a Biscoff or Speculoos) in my pantry. Hmm, I’ve melted down Nutella before, why not cookie butter? Cookie butter=flavor town. It’s rich, buttery, and spicy. Combine the butter with some brown sugar, maple syrup, and cinnamon, and your mouth will be begging for more. Sprinkle in some cinnamon chips, and you have yourself a serious granola addiction. My dad knows all about a granola addiction; specifically, a cookie butter granola addiction. It’s like crack…only legal. When he runs out, I find him at my door with the empty jar in his hands. No words are said; he just shoves the jar in my direction, expectant and irritable. Oh, we’re not going to talk about this? I say with my eyes. GRANOLA, he pleads, red-eyed and unblinking. I walk away with the jar. Cookie butter does not deal well over direct heat. 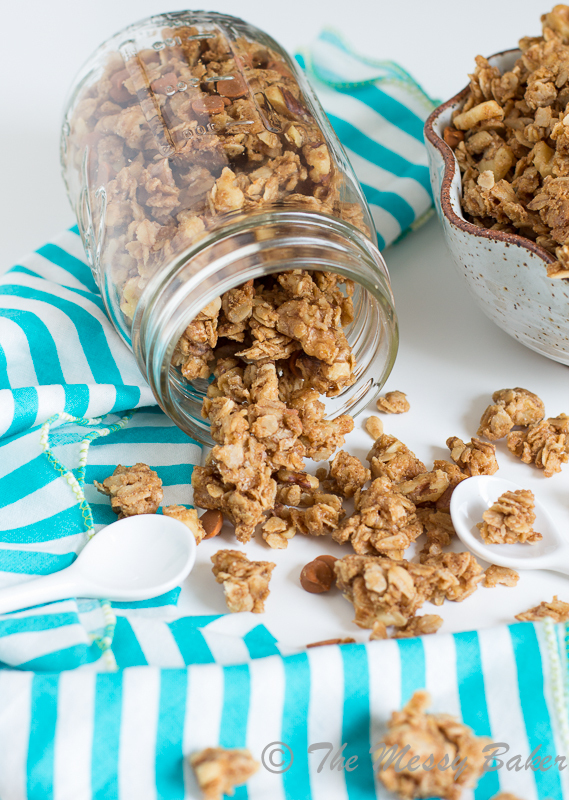 It causes the butter to seize and get grainy–not acceptable for perfect granola. The key to perfectly melted cookie butter is whisking it into the pre-warmed maple mixture. Do that, and you’re golden. 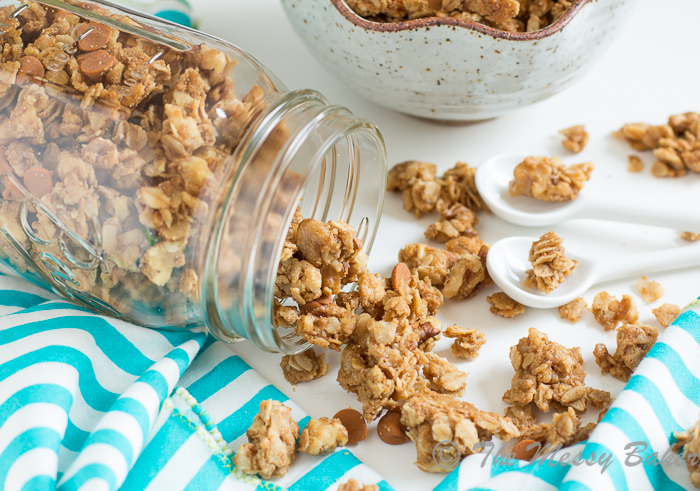 Prepare yourselves for a fierce cookie butter granola addiction. In a large bowl, add oats, pecans, cinnamon, and salt; stir to combine. Heat the maple syrup, oil, and brown sugar over medium-low heat until the brown sugar dissolves, about 3 minutes. Take the mixture off the heat and whisk in the cookie butter until melted and semi-smooth. Pour the cookie butter mixture over the oat mixture. Fold until the oat mixture is evenly coated. Transfer the mixture to your prepared baking sheet. Bake for 25-30 minutes, stirring every 10 minutes, or until the mixture is golden brown. Remove from the oven and place the pan on a wire rack. Cool the mixture completely. Stir in the cinnamon chips. Transfer the mixture to an airtight container. Store for up to 2 weeks. I wouldn’t even need milk, just a spoon and I would mindlessly eat this all day. this granola though girrrrl, YUMMMM. Cookie butter=count me in! THIS is the granola I need to wake up to for breakfast! I’m a HUGE fan of TJ’s Cookie Butter. You ARE the Snack Master! YEEEEES! Now this is granola! I need to get my hands on cookie butter asap! You did not! This is redic! I am the snack queen these days too! My snacks of choice are always salty! But this combines just enough sweet and salty. You are also so right, those girl scouts are evil. 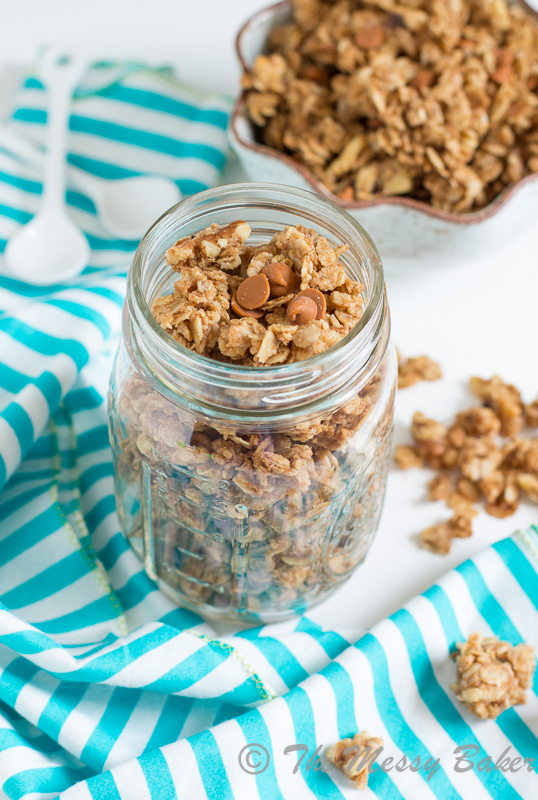 Your granola recipes are always tempting! And this one is no exception! Love it! I love this granola. I scanned your ingredients and I have it all so this is so happening this weekend. Would make for a great breakfast!! oh my god this granola is AMAZING. I totally need to make this for my upcoming flight – sounds like perfect airplane snack food! Love the maple and cookie butter combination! Perfect granola! I used my mentalist powers to reach you from Baltimore. I totally know what’s up in the brain of Kim. Cinnamon chips and cookie butter? Be still my heart! My granola addiction is about to grow! You always make the best granola! I need a jar of this in front of me asap! Aw, thanks! I have a serious granola addiction. I am new to the food blog world and I love your blog. This granola is possibly the most delicious snack I’ve ever had. I just made my 4th batch of it today since reading the recipe 3 weeks ago. I’ve been sharing it with everyone I know and creating addicts left and right. Thanks for such a great recipe! Hi Amy! I’m so happy to hear that you love my granola. Wow, four batches–you’re on a roll! I love that you’re creating granola addicts. Thank you for taking the time to comment. I love hearing from my readers. You brightened my day. I have EASILY made about 15 batches of this granola over the past month. I made it for holiday gifts galore and tucked in a copy of your info/recipe along with the gifts…I gave it to coworkers, my vet, mailed it around the country to friends and family…and keep making a batch every week for me and my husband. 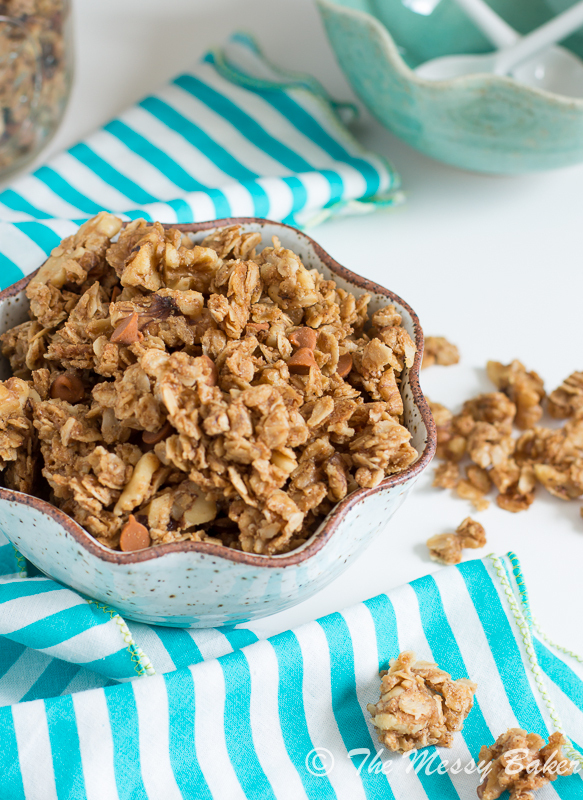 I tested four granola recipes when trying to figure out which one to make as a gift…my husband and I both felt this one was head and shoulders above the other recipes. Pingback: Maybe the Best Granola Ever! | Seasoning the Moment! Maybe the Best Granola Ever! | Enriching the flavor of every day!